You are browsing the archive for SessionIdeas. Apologies for the brevity of this blog post – I’m keeping this brief to make sure I get it posted before LOD-LAM. Archival records are hard to find. They’re often in large bodies of records, difficult to browse through and generally less cut-and-dry than publications which are intended for formal publication and/or public consumption. Archival finding aids are the researcher’s traditional first point of contact, providing background biographical information on the organization and/or personal creator(s), as well as a description of how the records are arranged and description of the various levels of organizational hierarchy. They’re useful! But they’re also a bit old-fashioned, at least as typically implemented. The finding aid structure imposes a few issues for linked open data applications. Most countries’ archival description standards are based on a strict hierarchy from higher levels of description (fonds, etc.) to more precise levels of description (series, sub-series, file, item) with fairly rigidly prescribed relationships between items. The finding aid also assumes a “paper” whole-body approach, rather than a linking approach. This is kind of non-webby, and imposes a stricter order on documents than their creators may have had, in many cases. Archival descriptions have some inherent ambiguity because interpretation of archival holdings is not always cut and dry, but that doesn’t mean that we have to be ambiguous in how we create those descriptions. We can be precise about the ways in which our collections are ambiguous. Certainly more, which we can talk about at LOD-LAM! The extent to which all this can be implemented will depend on the organization, of course – retrofitting older archival descriptions for all of this would be time-consuming, if practical at all. But I think there are a lot of benefits to be gained by changing practices going forward, and I see this as an enhancement to current descriptive standards/practices that can benefit more than just linked open data applications. Probably more than two, but for now I’ll focus on these. What are the opportunities that arise from moving the technological and conceptual platform away from domain-specific to generic RDF; the move away from “understandable by an expert” to “useful and usable by everyone”? This is particularly relevant when we’ve got content (documents, images, experiences, information) (freely) available online, but also in the cases where we have metadata about other things that aren’t available online. On a broader note: what does openness actually mean for an organization? It is something that potentially affects everything from staff attitudes to strategy…I don’t think that there is a roadmap for institutions taking the leap into openness. OAI-PMH is a great way to ship large "collections" of records between repositories. The Open Archives Initiative – Protocol for Metadata Harvesting (OAI-PMH) is the foundation on which the IMLS Digital Collections and Content project and the companion Opening History aggregation are built. * Although small increases in the use of OAI-PMH were seen over the course of the project, less than a quarter of IMLS National Leadership grant projects provide item-level metadata using OAI-PMH [1, 2]. In some cases, the projects in the the missing 75% are legitimate – they are not collection with readily available item-level metadata (e.g. narrative exhibits, interactives/games, etc.). But this still leaves many projects/collections out of a broader network of resources. OCLC/RLG found a higher percentage (48%) of member organizations using OAI-PMH, but it is unclear how much of their metadata was shared this way . While recognizing that OAI-PMH has been successful at making millions of descriptions available, it’s worth pausing to wonder if 25-50% adoption is good enough. What are the lessons from OAI-PMH that will be important for LOD-LAM? How is the lack of one, common protocol for sharing data a benefit and/or a danger? Will Linked Open Data be “low barrier” for some, but untouchable for many? What are the lessons from the Museums and the Machine-Processable Web and Europeana for U.S. organizations? One of the reasons that OAI-PMH succeeded was through support of funders – what should funding agencies tell projects about implementing LOD? LOD offer the opportunity to move smaller units of information, quickly, to more access points. 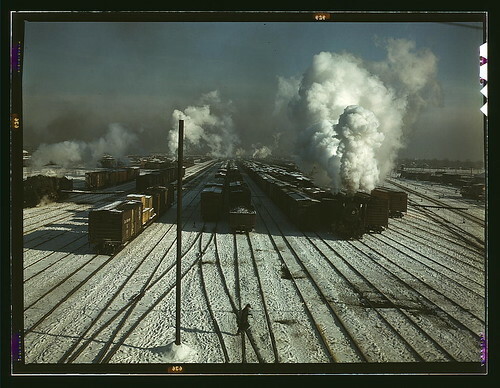 C & NW RR, a general view of a classification yard at Proviso Yard, Chicago, Ill. (LOC). Courtesy Library of Congress on Flickr. * Disclaimer: these opinions are my own and may not reflect official opinions of the project or my colleagues. This post has been cross-posted on Inherent Vice. The ‘linked’ part of LOD can eat up a lot of time and resources. Machine processing might be able to match up places and subjects to established LOD sources, but disambiguating people and events can be trickier. Crowdsourcing may be one way in which these more complex or subtle relationships can be defined. It’s a topic that is perhaps worth some time at LOD-LAM. There are lots of examples now of projects created by institutions to enlist the public in extracting structured data from unstructured sources, or adding to existing descriptive data relating to objects, photographs or documents. There are fewer that seek to use crowdsourcing to define relationships between items, or between items and other entities. Any examples? You can allow users to add semantics to the tags they add to collection items, creating machine tags (or triple tags). This allows people to refer to standard vocabularies in their tags, or define relationships with entities outside of your collection database. Flickr, for example, supports machine tags (you can browse them all here). Machine tags are of course meant to be read by machines, so they’re not all that human friendly. If you wanted to encourage their use you’d probably want to create tools that simplified their construction, and perhaps some feedback mechanism to demonstrate their significance. That’s basically what I was experimenting with in the Flickr Machine Tag Challenge. People can generate machine tags automatically using my Identity Browser (based on People Australia), add them to Flickr, and keep track of their work via the FMTC scoreboard. Similarly I created a simple tool for generating machine tags from the NLA’s newspapers database. One of the good things about the Linked Data is that it’s linked! There’s no reason why all the activity has to happen on institutional website. It may be that the best way of enmeshing you collection in the cloud is to provide clear persistent uris and to help people and projects that use your stuff to publish their own research as LOD. Make it a co-operative endeavour rather than a ‘come to our site and help us’ project. This is what I have in mind for Invisible Australians, but we haven’t got very far yet. I’m sure there’s already something like this, but I can’t think of any examples right now (it’s late!). In wondering about where to go with the FMTC, I started thinking about a meta-level biographical linker, which would allow people to define and publish relationships between resources about people on the web. Sort of a semantic bookmarker, rdfa generator, biographical register… Perhaps using tools like LORE or even Zotero. The point being, of course, that the links or annotations can exist completely separately from the resources they’re describing. Anyway, I know there are people coming to LOD-LAM with much more experience than me on the crowdsourcing front, so I’d be really interested in having a discussion along these sorts of lines. It seems that a lot of the LOD-LAM discussion and activity so far has centered on collections — the stuff sitting in collection management systems and databases. This is of course a natural starting point, but it might be good to consider what else there is that would benefit from LOD treatment. In particular, I’m interested in thinking about what we can do with the large amounts of contextual and interpretative material that LAMs produce — online exhibitions, finding aids, fact sheets, publications, encyclopedias, indexes, photo galleries and more. These sorts of things are packed with unstructured data — people, places, events and of course links to the collection dbs. By extracting and exposing these structures and linking into local authority systems and the LOD cloud we could create rich structures for discovery and understanding. And then there’s material in the cloud — Flickr and elsewhere — as well as the work of our users, captured in blog posts or Zotero libraries. How might we start to develop a set of tools and practices that encourage semantic links across the wider LAM ecosystem? I thought it might be a good idea to start to introduce some of the topics we want to cover at the meeting so that people could begin to wrap their heads around these and related ideas. I am particularly interested in exploring the services that we can create based on LOD that will connect users to resources held or managed by LAM. There has been a lot of activity (well, at least some activity) around the creation of data sets and vocabularies, but so far little has been done or even speculated on the ways that users will benefit from this linked data. I would like to spend some time exploring “wild and crazy ideas” about possible services based on LOD. To make things a bit more concrete, I always go back to Vannevar Bush’s MEMEX – with its function of organizing, storing, linking and collaborating around information resources. If MEMEX was a great idea in 1949, what’s the appropriate great idea for 2011? I encourage folks to come to the meeting with ideas in this area.